It’s been a while since my husband and I went out for a nice dinner. But he got a bit of a promotion, so a bit of a celebration was in order. I’ll apologize in advance for the photos, the dark loungey setting is not conducive to taking great photos unless you have the right equipment (I don’t). But I assure you, the food looked better than any of these photos would indicate. 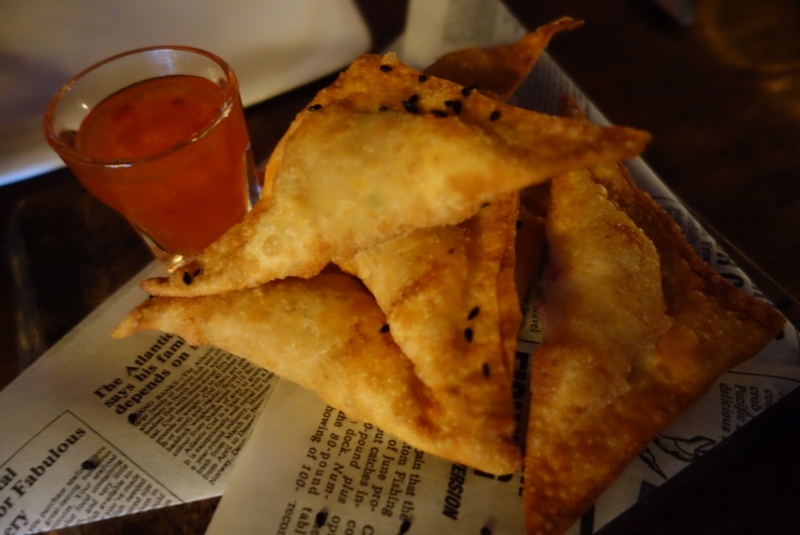 We decided to share the crab and cream cheese stuffed wontons to start. They were nice and light and mostly importantly, tasty, thought neither my husband or I thought the sweet chili sauce was the right fit. Plus once you bite them once, it’s hard to get them into a shot glass for the sauce. Still, totally recommended despite my tiny concerns. 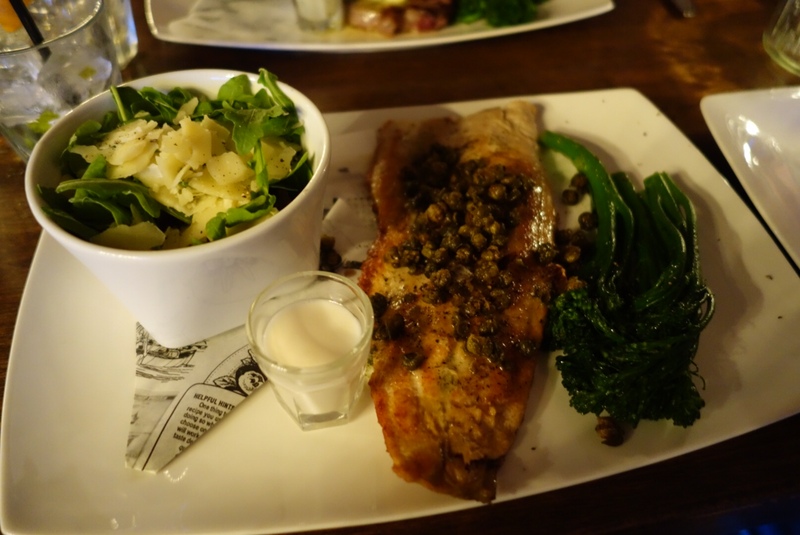 For the main, I had a very large piece of Arctic Char along with the star of the dish, fried capers. Like I mentioned above, the photos do not do the dishes any justice. I have to give a good shout out to the very pleasant and professional service that we received. And oh – the drinks! My husband opted for an Old Fashioned and I got a drink that unfortunately is not on the menu shown on the web. I believe it was cucumber, mint, lime and bourbon. Look for something that sounds like that. It was really tasty. Lastly, as we were leaving, I ran into a fellow Oilers fan. She was at a table of six, so I was able to catch a glimpse of a few other meals being served. We also tried the brussels sprouts chips. I think they had been on the table a while, so they weren’t quite fresh and crispy, but definitely worth another try on a return visit. 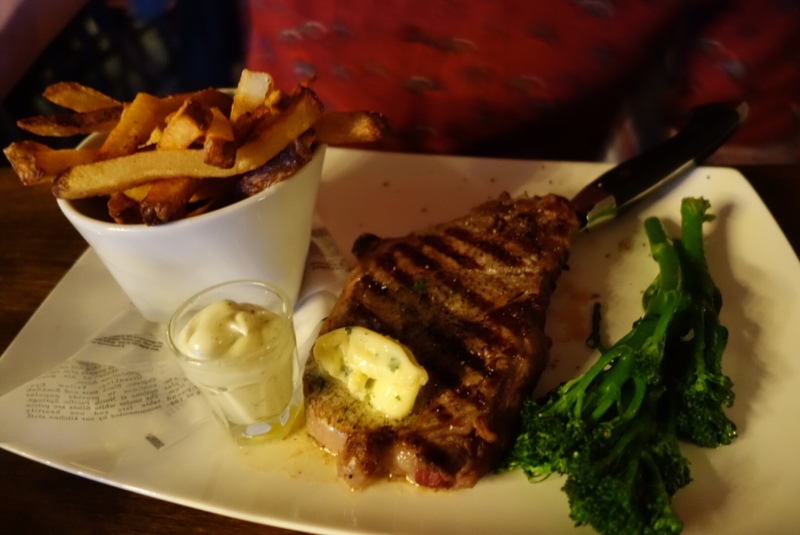 Overall it was a very good experience with a menu that strays away from the pub standards here in Whitehorse. Glad we tried it and sad it took us this long! It’s a bit more expensive than the restaurants we generally frequent but it’s also more creative. Likelihood of return visit: Quite likely. Posted in Visit and tagged Dinner, Downtown, Drinks, Lounge, Upscale, Visit, Whitehorse. Bookmark the permalink.